Remember Bajaj Chetak Scooter? It's Coming Back In New Avatar! Remember Bajaj Chetak Scooter? It’s Coming Back In New Avatar! The image of an Indian family with the husband driving a Bajaj Chetak scooter, wife sitting at the back with 2 kids will be embedded forever into our memories. In 2009, this image got a slight interruption as Bajaj had decided to stop manufacturing their Chetak scooters and solely concentrate on bikes. But with stiff competition from TVS Motors, Hero and Honda, Bajaj’s grip on the 2 wheeler market is sliding at a faster rate than they had imagined. Compared to 2,73,323 units sold in February, 2014, they only managed to sell 2,16,077 units in February, 2015, a drop of 21%. Investors were worried, so were the management of Bajaj Auto. But, their decision to revamp Chetak and reintroduce it in the Indian market has brought smiles all over. Although rumors were abuzz since last year, but a report published in ET has confirmed it. As per various sources, the new Chetak would be without gears, fully automatic with 125-150 CC four-stroke engine. This gives us hint that they may target a segment which is currently dominated by Activa from Honda and Scooty from TVS Motors along with other such models. Bajaj may launch this new model of Chetak during Auto Expo 2016. Investors have given their green signal as the day this news arrived, Bajaj Auto shares picked up momentum and gained 1.2% while at the same day TVS Motors shares dropped 2.5%. Bajaj Chetak was launched in 1979, based on the design and specifications of Italian scooter company Vespa’s Sprint model. The name Chetak was based on Maharana Pratap’s horse which was legendary for its bravery and power. In the mid 1980s, Bajaj discontinued their partnership with Vespa, and started producing 100% Indian made Chetak scooters, which gave rise to their famous slogan: “Hamara Bajaj” which means “Our Bajaj”. It was the symbol of a new found independence in manufacturing which India was experiencing, and the scooter became one of the biggest hits of 2-wheeler industry. During 1990s, more than 100,000 units sold every month, and the waiting list was for decades! People actually paid extra to buy a Chetak, which had become an icon, a trendsetter in India. Although it faced competition from LML India, which launched several units based on Vespa’s various models such as Vespa PX 150, Sprint and more, they never got even close to what Chetak was in its heydays. But during the early 2000s, the sale of bikes began to pick up, and the focus of Bajaj Auto shifted to this new segment, which was registering more sales. This change in priority can be seen in this TV ad of early 2000, where the concept of ‘Hamara Bajaj’ is being used, but instead of scooters, they are showing bikes. As per insiders, Rahul Bajaj, who was the chairman of Bajaj Auto was in favor of continuing with Chetak and other models of scooters but Rajiv Bajaj, MD of Bajaj Auto wanted them to discontinue and solely focus on bikes. Eventually Rajiv won and the production of Chetak was stopped in 2009, which became a sensational news and even international publications covered this news, bemoaning India’s loss of heritage and tradition. It would be interesting to observe how Bajaj markets this new Chetak, in 2015. Will they use “Hamara Bajaj” concept or device entirely new form of marketing communication? "Remember Bajaj Chetak Scooter? It's Coming Back In New Avatar! ", 5 out of 5 based on 12 ratings. it is good to know that they realised their mistake in discontinuing the Bajaj scooter. I was using Bajaj 2 stoke from 1991 to 2002 and switched to the 4 stroke in 2002 October when it was introduced. However their service centres stopped servicing it from 2007 or so. The fresh air intake arrangement is not good as it is connected at the carburettor with a small flexible rubber hose, which got damaged and no replacement could be found anywhere. No service and no spares, atleast in hyderabad. Hope they will come up with a better durable arrangement. Then perhaps I may be tempted to exchange it instead of dumping the present one in favour of Honda activa or TVS jupiter. This is really good to see that bajaj company is about to relaunch chetak scooter. As said by someone earlier, I too believe that chetak would be better with gear system in some simplified manner at least. My dad had purchased chetak in 1985 when he started his working life. We have this scooter still in gud running condition and I am using it quite frequently. Every time I use I feel very interesting to run it here outside. This scooter has proved that old is really good. I had used Bajaj chetak from 1988 – 1997 clocking 85K during the period and used gearless Kinetic, activa till 2007 and again geared vehicle Honda Eterno since 2007 till date with present odo 55000. The vehicle is excellent compared to chetak and still a mileage of 52 + in city. Though for geared vehicle market is not big enough, there are avid buyers for this segment. Even if Bajaj re introduced this geared vehicle, the present market dynamics are changed and I doubt with their older strategy they can be successful unless the product is far superior. No doubt Bajaj was successful earlier with the market conditions being No other scooter worth name, sturdy vehicle for Indian roads, service net work. But comfort wise as we were not used the comforts earlier, it was ok. Now with the awareness of comfortable drive and mostly one person driving (gearless segment scored over on this point only) whether Bajaj can come out with a product now is a bit doubtful. Besides, with the petroleum prices sky rocketing, any product without taking this point into consideration may not succeed. How the two wheeler market is dominated by comfortable driving rather than value for money driving, meaning, after a few years of driving, these gearless vehicle gives far less mileage than it was still people continue to use because, they purchased it. So the manufacturers should invest in technology to bring out far superiod product and life of such a product should be long enough. Hope somebody will come out. I have 1989 model Bajaj Chetak Scooter (ACP-0405). I purchased it in the year 1983. Since, then I am using it. Now I have wrist problem to my left hand. Sometimes, it is causing interruption to ride my Chetak. I am happy that Bajaj Company introducing new version of Scooter with Self-start, without grears, and other features, like Trip meter, pass light, powerful head light, tubeless tires, front side storing place like 1989 chetak, helmet keeping place and flip remote key. The Bajaj Scooter shall have all the features. Then only it will overtake all it’s competitors. The quality of body material shall be as like as 1989 model. With gear and without gear model shall boost up it’s image. Think twice. Please send details to my mail id, if any. We have Bajaj Chetak 1983 Model which had run just 7000+ kms only and it is in immaculate condition. Bajaj Company can show this 32 yrs old scooter as proof for excellent Performance and durability. HI I feel very happy to know that at last chetak will run again on indian roads.but without gear seems to be little weak force i feel because in the hills gear will generate more power although its very early to say this, I would rather request the management to think twice for without gear “hamara bajaj” so pls early launched. I am using bajaj chetak 2006 model. I am purchasing the scooter in the year 2007 from that period I am using this scooter. It is excellent the body has damaged in the foot side so please if available in your factory I have purchase the new body. Now itself the scooter has giving 50kms per liter in Proddatur roads i.e., Andhra Pradesh, Kdapa district. intimate me whether you are releasing new vehicles or deliver me a new body of that model please. Reply soon am enthusing for that. G.Rama Krishna, D.No.9/16-Medara Street, Proddatur (post), Kadapa (Dist), Andhra Pradesh. India. why you are not replied to my request if you are released the Bajaj Chetak vehicle in the market all brands are come down only Bajaj Chetak is in top sales. The features are very comfortable please respond to my request because this is “Hamara Bajaj” my mail id is [email protected] my whats app No.9618516137 my personnel No.9177500399 I am President of Rotary Club, Proddatur RI Dist.3160, Club No.15675. yours G.Rama Krishna – Proddatur A P.
I am really very happy that the Bajaj chetak is re intro-doucing the New Model of self start scootor very soon .Please intimate the exact date and month when it will come in the market. I am using old model of HAMARA BAJAJ CHETAK SCOOTOR SINCE LAST 35 YEAR NOW. I WANT NEW MODEL SELF START BAJAJ CHETAK SCOOTOR. Please confirm when scooter come in market. well you have the incorrect year of launch of the first Chetak! its not 1979, as we still have our Chetak purchased on Oct 13, 1978 with us !! all the earlier variomatic gear scooters introduced by bajaj scooter ltd were utter failure. I am one of the cheated person who had purchased their SAFFIRE scooter, who had to leave in the workshop forever. so the fans of Hamara Bajaj, aware about their scooter segments by remember the sad end of all the previous gear less series. avoid a pitfall. I have Chetak 99 model and recently brought Chetak 4 strok . I like to drive Chetak. Bajaj starting making Chetak 4strok with gear and auto gear. It is good news . I am willing to buy with gear scootor. We have 1 bajaj FE, two 4stroke chetak, 1CT 100, one of 4S CHETAK is brand new condition (2002)model and running without any difficulty. This co. Is very bad because after marketing, any parts of this scooter will be not available in market. Bcz this co. Can think about itself only. You know Which is our fault ? We have bought the chetak scooter. It’s too much. So I requesting buyers atfirst you will be aware that this bajaj co. For how long Will be able to continue their marketing & producing their product scooters. & also confirm by availability of parts. I am writng from my previous experience. Brother, I renewed my another 4s chetak 2004 moded, ie Color, Engine, & all releted work of scooter & made it as like company peace, in FEB-2015 & necessary all parts related to e ngine are received from auto parts shop & my scooter as on day, date running on road without any problem. very soon .Please intimate the exact date and month when it will come in the market. I am using old model of HAMARA BAJAJ CHETAK SCOOTOR NOW. 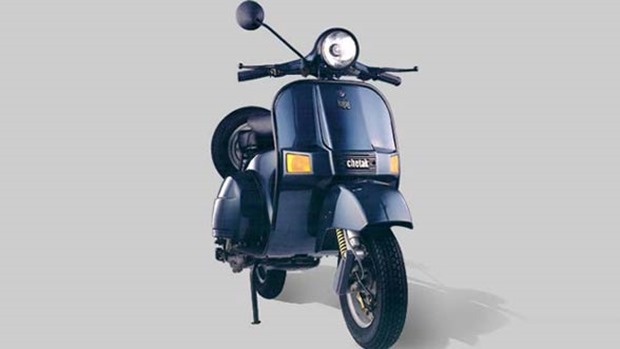 He its really nice to introduce a new bajaj chetak……..I still use the old launching model of chetaks which was purchased in 1984 by my father…it still on road…..Thanks to Rahul Bajaj to reintroducing the new bajaj chetak. …….. I am waiting for it…..
Bajaj should start production of gear and nongear scooter production as early as possiible. Good to hear that our hamara bajaj Is launching back without gear , I am having 99 model chetak .on demand if company makes chetak 4 stroke I will buy at any cost. Because I learnt driving at age of 11 and it is the first vehicle in my life I rode and still continuing. Plz launch both with gear and with out gear.